On December 3, 2015 the Global Gift Foundation USA launched its Initiative for the first time in the United States alongside the event’s Honorary Chairs Eva Longoria and Ricky Martin during Art Basel at The Related Group’s Auberge Residences & Spa Miami located at 1400 Biscayne Blvd., Miami, Florida. The evening was a sold-out event. Notable guests included, Telenovela stars Amaury Nolasco and Jencarlos Canela, top-model Esther Cañadas, the moniker of street pop art Brainwash, US State Treasurer Rosa Gumataotao Rios, Loren and JR Ridinger, Spanish Trade commissioner Inmaculada Gutiérrez, NBA Alumni Scottie Pippen and wife Larsa Pippen, designer Ricardo Barroso, Eva Hughes & Global Gift Ambassador Esther Porto. The event featured a cocktail reception, dinner by La Basque and wines by Rioja, special performances by Carlos De Antonis, Mayte Valdes, Carlos Barrionuevo, Manel Gutierrez, Andres Vadin, Jose Cortes and music provided by DJ Sub Zero, a live auction featuring one-of-a-kind items such as an incredible art piece by Brainwash, a timepiece by the makers of Swiss Luxury Watches Hublot worn by Ricky Martin, art piece by Agustina Casas and a piece from Domingo Zapata’s Panda series, other items included jewelry provided by Messika. Lili Estefan from ‘El Gordo y La Flaca’ and TV host and comedian Michael Yo co-hosted the evening. During the awards ceremony Mr. Jorge M. Pèrez Chairman, and CEO of The Related Group was awarded the prestigious Global Gift “Philanthropreneur” Award. 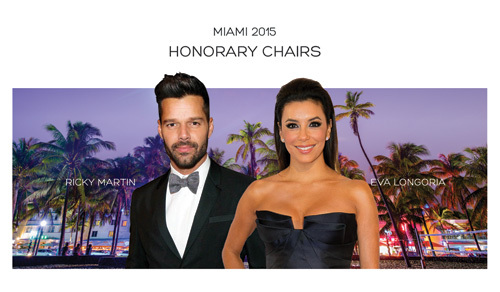 The 2015 Global Gift Initiative - Miami was in support of The Eva Longoria Foundation, The Ricky Martin Foundation and the GlobalGift Foundation USA. With the support of the Miami community, the foundation was able to support several women, children and families not only locally but across North America.